Tawas Middle School students help to manage invasive Phragmites in their community – learning and having some fun along the way. The Iosco County Conservation District, Huron Pines, Huron Pines AmeriCorps, Michigan Sea Grant, Michigan State University Extension, along with several community partners and the Ascension St. Joseph Hospital, have been working together to manage thi s particular Phragmites stand since 2017. Through the Northeast Michigan Great Lakes Stewardship Initiative (NEMIGLSI) network, these partners quickly identified an opportunity to connect with Tawas Area Schools and involve students. Working with lead teacher Adrianne Dittenbir and a team of teachers from the school, this school-community partnership blossomed with the idea that this project could serve as a great learning opportunity for students – and a great opportunity for students to apply their learning and contribute to the project in meaningful way. The team of community partners joined in support of the students for their day in the field, sharing their time and expertise to enhance the students’ learning experience. Working in teams, students moved among several stations. One station involved collecting field data to calculate density and survival rates of the Phragmites. Another explored the issue of invasive species and Phragmites, a little plant biology and comparing native and invasive species, and an overview of the treatment and management process. Students also mapped the site, discussing future habitat restoration plans and opportunities following removal. They also did some litter pickup – enhancing the local grounds, their community, and preventing litter from ending up as marine debris in Lake Huron. Students are applying their science and math skills to monitor and evaluate effectiveness of the treatment. Students first visited the hospital site in October 2017 to collect data before the first treatment of Phragmites took place. 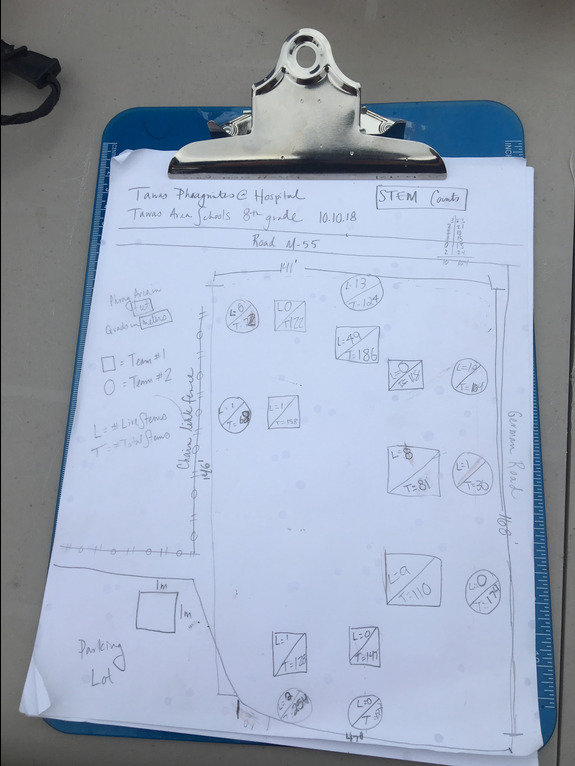 They measured and mapped the total area infested with Phragmites and counted plant stems in several sample areas to calculate density per square meter. This year a new group of students returned – exactly one year to the day – to repeat this same research protocol. Additionally they calculated proportion (and percentage) of living plant stems in each of their sample plots to determine how successful the previous year’s treatment was. Students put their math skills to the test measuring, counting, adding, calculating density and proportions – their applied math relevant in analyzing, interpreting results of their science investigations in support of this project. The data students collected at each visit is informing future treatment of the Phragmites by partners and supporting conservation efforts in their local community. This project reflects a great example of place-based stewardship education in action. This school-community project partnership resulted in a mutually beneficial opportunity for students to expand their learning beyond the classroom. Students served as valued partners in this wetland habitat restoration effort, and in trade, community partners are invested in school improvement opportunities, supporting this educator team and enhancing the student learning experience. And with their feet wet and hands a little dirty, these enthusiastic students enjoyed a fun-filled, hands-on learning experience while restoring wetland habitats within their own local community. Michigan Sea Grant, MSU Extension, Huron Pines, among other partners, provide leadership for the local NEMIGLSI network, which is part of the statewide Great Lakes Stewardship Initiative (GLSI) partnership. This partnership provides a variety of information, resources and support for place-based education, including the benefits of place-based education as an educational strategy and guiding principles for place-based education in practice.